There is no question that Disney and Lucasfilm have succeeded with Rogue One: A Star Wars Story. The movie is going to cross the $1 billion mark at the box office any day now and for the first of these new Star Wars anthology movies, that is pretty impressive. Despite the success, for some reason, Disney can't get Chinese audiences to love Star Wars. Case in point; Passengers absolutely obliterated Star Wars: Rogue One at the box office in China this weekend. 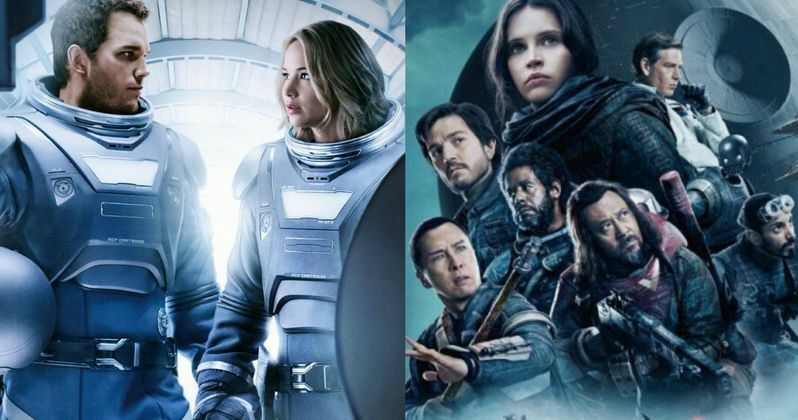 According to The Hollywood Reporter, the Chris Pratt and Jennifer Lawrence sci-fi adventure movie debuted to $17.5 million in China, while Rogue One: A Star Wars Story only made $9.8 million. That represents an incredibly steep 71 percent drop from last weekend, when Rogue One debuted to $31 million. That $31 million number in itself was fairly disappointing, but the fact that a movie like Passengers was able to dethrone the latest Star Wars movie in such a big way is truly telling. Part of the problem is that the original Star Wars movies weren't released in China, because the market wasn't open for movies made in the U.S. at the time. The prequel trilogy did get released in China, but those were, as most of us know, not nearly as beloved as the original trilogy to say the least. So, many people in the country aren't as familiar with the characters and universe that Star Wars inhabits. Despite Disney's massive marketing campaigns for both Star Wars: The Force Awakens and Rogue One: A Star Wars Story, a movie that included two very recognizable Chinese actors in the form of Donnie Yen and Jiang Wen, they haven't been able to crack the market wide open. On the flip side, Passengers has underperformed on the domestic side of things and was not well received by critics. The movie currently has a pretty terrible 31 percent approval rating from critics on Rotten Tomatoes, whereas Star Wars: Rogue One has a very solid 85 percent approval rating. That didn't seem to matter to Chinese moviegoers. Outside of China, Passengers has also performed well outside of the U.S. and has grossed $147 million in other foreign markets. That is good, considering that the movie had a reported production budget of $110 million and has only made $90 million domestically so far. For comparison's sake, Star Wars: The Force Awakens made $2.06 billion worldwide, good enough to become the third highest-grossing movie of all-time. However, only $124 million of that came from China, which was only the 13th biggest movie in the country that year. Star Wars has managed to dominate in virtually every other market but China seems to be the tough cookie Disney just can't crack. Despite that, Rogue One: A Star Wars Story will still do just fine, since it has made just shy of $1 billion with very little help from Chinese moviegoers. As for Passengers, the Chinese box office will help make that movie profitable, as opposed to the bomb it looked like it might be when it didn't quite connect with U.S. audiences. Maybe Disney can get Chris Pratt and Jennifer Lawrence to join the cast of a Star Wars movie and see if that does the trick in China.